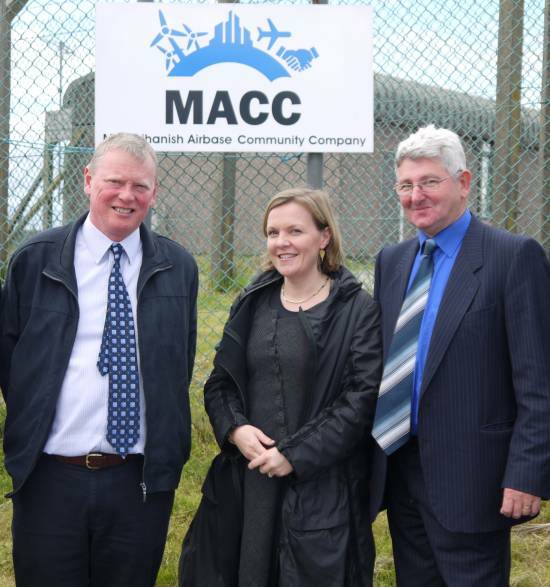 Directors at MACC were delighted to welcome Highlands and Islands Enterprise’s Rachael McCormack, Director of Strengthening Communities, to the site on Tuesday 3rd June. Ms. McCormack, who is responsible for HIE’s work in directing initiatives to help local people acquire and develop community assets, was given a tour of the site along with her colleagues, Douglas Cowan, Area Manager for Argyll & the Islands, and David Smart, Head of Regional Development. After viewing the land and buildings on site, our guests were impressed by the vast potential that is on offer at Machrihanish Airbase and were interested to hear of MACC’s plans for future development in a number of sectors. MACC is Account Managed by the Argyll and the Islands Area Team of Highlands and Islands Enterprise. HIE is an ambitious organisation which integrates economic and community development and MACC are grateful for their ongoing support in shaping the future of the airbase. Ms McCormack is pictured above with Chairmans of both MACC and MACC Developments Ltd, Ian Wardrop (left) and Jim Martin.